Standing for "Fight, Love, Live," Filoli is a 654-acre historic country estate with a 36,000-square-foot Georgian country house and 16-acre English Renaissance garden. The gardens made up of terraces, pathways, pools, lawns, foliage, trees and flower beds are perfectly groomed and ever-changing with the seasons. 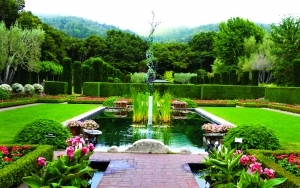 The gardens are most known for their collection of more than 500 varieties of roses. The gardens and estate are open to visitors from early February through October, with an annual weeklong holiday event after Thanksgiving. Advanced registration is encouraged for docent-led tours and guided nature hikes. Self-guided tours do not require reservation. General admission is charged.